Aloha kākou! When you are visiting in Hawaii, what kind of activity do you do? Shopping or just vacation? When you feel bored, I recommend going hiking on a trail. Hawaii has lots of mountains and trails. Some people think only about Hawaii having a beautiful ocean; however, Hawaii has beautiful mountains, too. Since, I like mountains better than the ocean, I hiked lots of trail in Hawaii, and I recommend the Koko Head. This trail is located on Oahu Island. On the top of the mountain you can see Hanauma Bay and if you have good luck, you can see Maui, Molokai, and Lanai Islands. This trail is really unique. This small mountain used to have a military communication station, so the trail has a railroad, that used bring up military items to the top of the mountain. It is steep jagged slope and railroad tie have 1048 steps. Actually, it is hard to climb up and climb down. Surprisingly, climbing down is harder than climbing up. The steps are only railroad ties and smooth sand, so you can slip. Most days, this trail is really hot and dry; therefore, you need to bring water and some food, when you climb this trail. 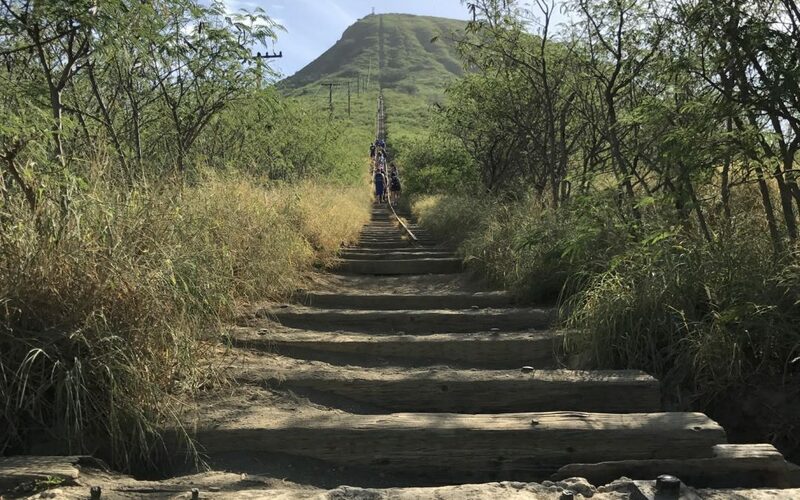 Koko head is hard to climb up, but when you reach the top, an awesome view is waiting. So in Hawaii, there is not only shopping or a vacation, but also hiking can make your trip more exciting. Mahalo nui.